Designed for blanking out diameters, pneumatic zig/zag can be adjusted to perform from two blanks, typically saving of 6% in material costs. • The Feeder & zig zag feeding mechanism is synchronized with Pneumatics & Electronic Panel & necessary Sensors & End Cushions for smoother Zig Zag indexing with the Press. Zig Zag Pneumatic Feeder is designed for blanking out circles, in zig-zag pattern to perform from two rows / pattern typically. It is used for blanking washer, submersible pumps parts, circlips, etc. 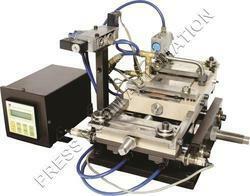 Looking for Zig Zag Pneumatic Feeder ?